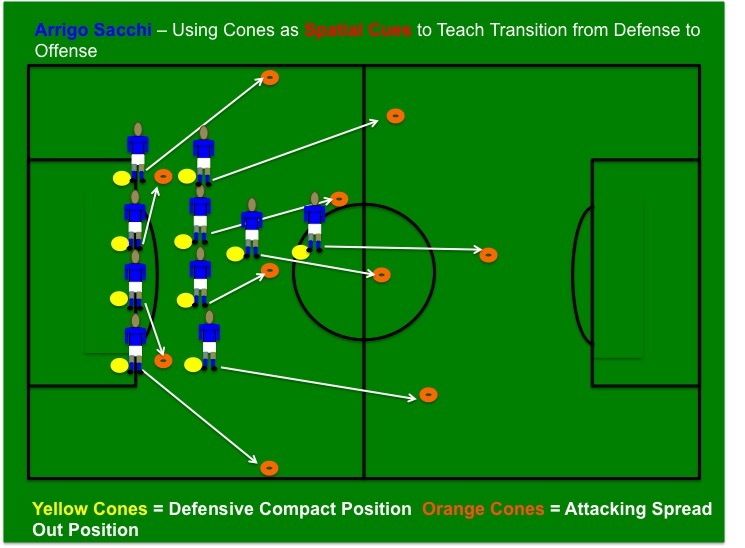 This simple exercise is a great way to teach defensive shape (defensive organization) using the yellow cones & attacking she (attacking organization) using the orange cones. The coach can call out attack or defend while the team takes the correct shape. After a number of repetitions remove the cones and practice again. This exercise can easily be used as lead up to shadow play. I first saw Arrigo Sacchi use cones as spatial cues while teaching the famous Italian 4-4-2 Zonal Defending & Counter Attacking. Previous Post Atletico de Madrid 6v2 Rectangle Rondo Variation : Book Coming Soon!